Although the weather may be starting to get colder and the holiday season may be upon us soon, it is never too early to start thinking warm thoughts about how to create a great porch with 2019 patio furniture trends. Gone are the days of dull plastic or ugly metal patio furniture, outdoor furniture today is not only comfortable but is aesthetically pleasing as well. Below are some great patio furniture ideas for 2019. Sectionals aren’t just for the indoor family room or living room. They are made for your patio as well. 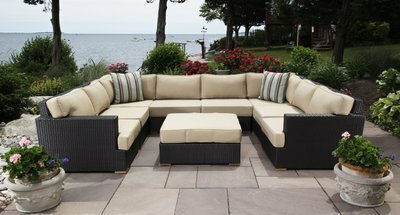 All weather outdoor sectionals create a comfortable and inviting atmosphere where family and friends can gather have a drink and talk. 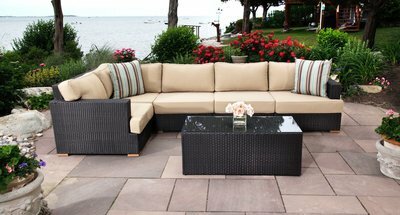 The fabric and materials utilized in outdoor sectionals are mildew resistant, fade resistant, and rustproof. 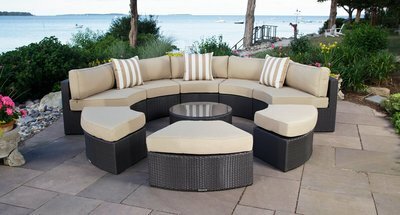 Sectionals come in a variety of colors and can be either L-shaped or U-shaped depending on what size fits your patio and or needs. Sectionals also can include comfortable ottomans so you can put your feet up and relax outdoors after a long day. One great outdoor patio furniture idea is a multipurpose daybed. Daybeds are not only relaxing and comfortable, but they can seat from 1 to 8 people comfortably. Daybeds come in different styles from round to rectangle. 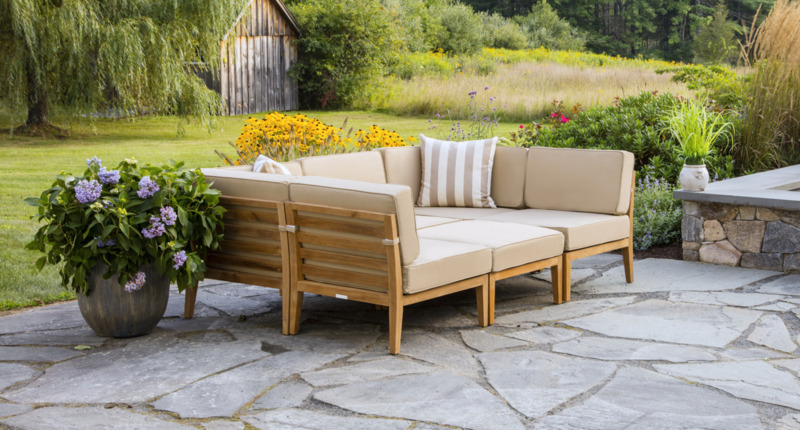 These versatile and weather resistant daybeds and can be pulled apart to create seating for guests or kept together for a large daybed. Round daybeds are great for entertaining because all guests can sit around the same table and have a conversation without excluding anyone. Large family size bistro dining tables are no longer just for the indoors at pubs, restaurants, or your home. 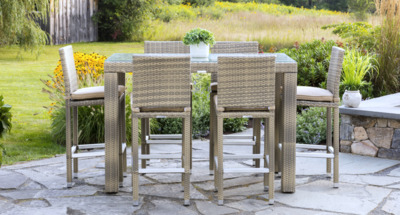 They make great outdoor dining sets for family and friends as well. With many families creating elaborate outdoor kitchens that include ovens, pizza ovens, refrigerators, sinks, etc. there came a need for larger outdoor dining tables. Bistro dining tables are perfect for patio and outdoor dining as they sit up higher so friends and family can have a better view of the landscape around them. These versatile tables are great for any size patio and work perfectly for families and large groups. They take outdoor patio dining to a more modern and sophisticated level. A great new furniture idea for the porch is a hanging chair. 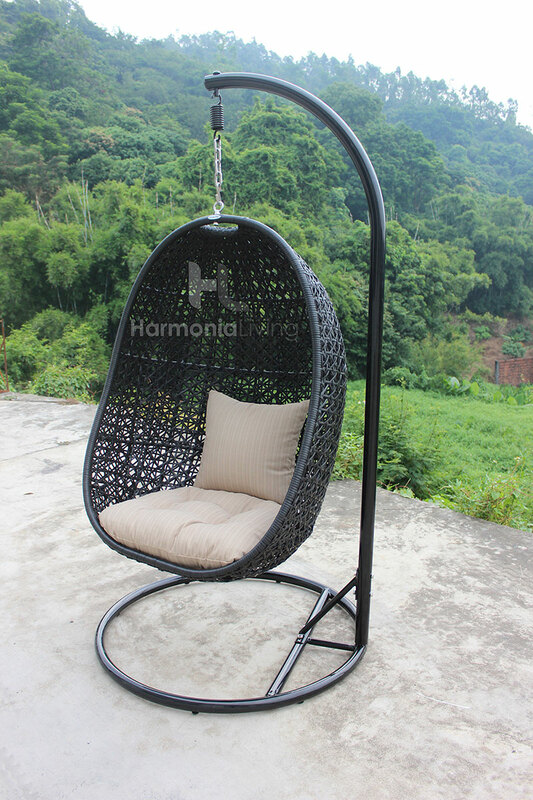 While the traditional porch swing has always been popular, hanging chairs are more comfortable and come in many different sizes and styles to suit any décor or aesthetic. Hanging chairs come in sizes that accommodate a single individual to large chairs that can seat many people. Hanging chairs can be hung from the ceiling or some come with their own stands making them more versatile and can be moved easily. Hanging chairs come in traditional wicker styles as well as unique geometric shapes and vibrant colors. This unique and comfortable patio furniture idea is sure to have a style for everyone. One great patio furniture idea is that of bringing the indoors out. You don’t need a lot of space to create an amazing outdoor room that looks like a traditional interior room. With a nice outdoor fireplace with hearth, you can create an outdoor space that can be enjoyed all year long. With outdoor patio furniture arranged around the fireplace and an outdoor hanging chandelier, you can create a unique and stunning patio space that will have the neighbors talking. A great patio furniture idea is to add vibrant colors. No need to stay with traditional and neutral hues, brighten up your space with vibrant colors and patterns. This idea goes especially great with patios that are located among trees and/or stone walls as the contrast of the greens of plants with the vibrant colors like purple, red, orange, and blue create a visually appealing space where you can go and enjoy the peace and quiet of your outdoor patio. You can choose to accessorize your current patio furniture with brightly colored fabrics, paint or stain your furniture with vibrant colors, or purchase new furniture comes in a color palette you desire anyway you choose it will make a happy and colorful patio. A new patio furniture idea that many people are embracing is repurposed furniture. Repurposed furniture is not only budget friendly it is also environmentally friendly as instead of throwing away old furniture you are creating a new functional piece that can be enjoyed for many years. 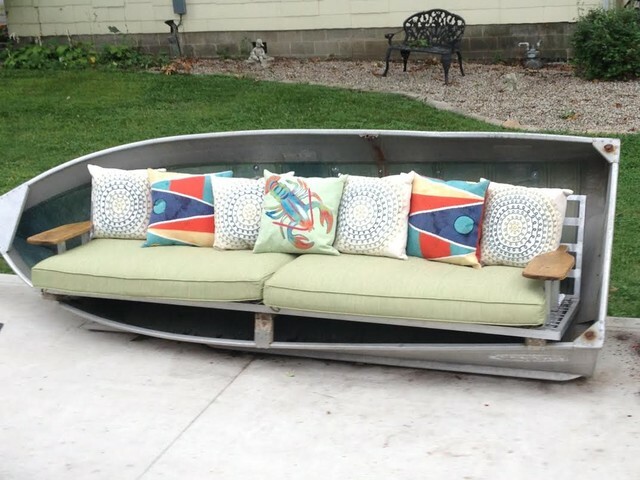 If you can imagine it you can create it with repurposed furniture and materials. One of the most versatile materials people use to create patio furniture is old wooden pallets as they can be easily converted into tables, chairs, and daybeds and can easily be painted or stained to reach the desired color to match the patio décor. While pallets are often used any material or piece of furniture can be used including bookcases, barrels, boats, doors, ladders etc. To make the décor complete you can also add repurposed items as accessories to create a style that is unique and one of a kind. Many patio furniture ideas for 2019 include breaking away from traditional patio furniture pieces and looks and opting for more unconventional materials and color. There is no right or wrong way to create patio furniture set so let your imagination and creativity run wild and make your patio different from all the others and have your friends and family in awe with what you create. The most important part is to have fun and create a patio that you can enjoy for many years.